CHICAGO – Every year, the Association of College and Research Libraries (ACRL) celebrates the opportunity to honor the outstanding achievements of academic and research librarians across North America. Made possible by generous corporate support, the annual presentation of ACRL’s awards, grants, and fellowships enables ACRL to honor the very best in academic librarianship. This year, ACRL once again seeks to celebrate and recognize the accomplishments of its peers. Members are an integral part of ACRL’s successful awards program. ACRL urges members to nominate colleagues whose work has influenced their thinking and growth as an academic librarian, and whose contributions merit recognition by the profession. Member nominations will ensure that the pool of candidates for each award remains both competitive and distinguished. Nominations and supporting materials for most awards must be submitted by December 7, 2018. Excellence in Academic Libraries Award (sponsored by GOBI Library Solutions from EBSCO), recognizes academic libraries that are outstanding in furthering the educational missions of their institutions. A $3,000 award is given for each type of library (e.g. college, community college, and university). Academic/Research Librarian of the Year Award (sponsored by GOBI Library Solutions from EBSCO), awards $5,000 and recognizes an outstanding member of the academic or research library profession. Hugh C. Atkinson Memorial Award (sponsored by ACRL, ALCTS, LLAMA and LITA), provides a cash award and recognizes outstanding achievements (including risk-taking) in the areas of library automation, management, development and research. College Libraries Section Innovation in College Librarianship Award (sponsored by SCELC), provides a $1,000 award and honors librarians who demonstrate a capacity for innovation in working with or serving undergraduates or instructors in the areas of programs, services, and operations; or creating innovations for library colleagues that facilitate their ability to better serve the library’s community. 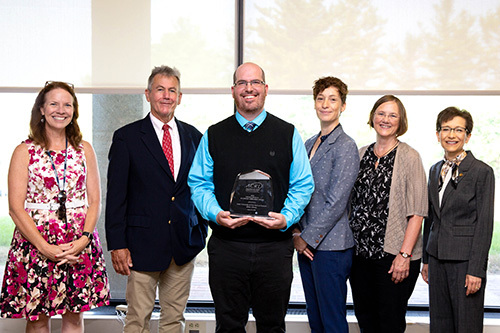 Community College Learning Resources Program / Leadership Awards (sponsored by EBSCO Information Services), recognizes outstanding achievement in library programs and leadership. The awards will be presented to two recipients, who will each receive $750. Distinguished Education and Behavioral Sciences Librarian Award, honors a distinguished academic librarian who has made an outstanding contribution as an education and/or behavioral sciences librarian through accomplishments and service to the profession. Miriam Dudley Instruction Librarian Award (sponsored by the ACRL Instruction Section), provides a $1,000 award and recognizes an individual librarian for significant contributions to the advancement of instruction in a college or research library environment. Instruction Section Innovation Award (sponsored by EBSCO Information Services), provides a $3,000 award and honors librarians who have implemented innovative approaches to information literacy at their respective institutions or in their communities. Politics, Policy, and International Relations Section Marta Lange/SAGE-CQ Press Award (sponsored by SAGE-CQ Press), provides a $1,000 award and recognizes a librarian who has made distinguished contributions to bibliography and information service in law or political science. Routledge Distance Learning Librarianship Conference Sponsorship Award (sponsored by Routledge/Taylor & Francis Group), provides a $1,200 conference sponsorship award to honor any individual ACRL member working in the field of, or contributing to the success of, distance learning librarianship or related library service in higher education. University Libraries Section Outstanding Professional Development Award, (sponsored by Library Juice Academy): $1,000 award to recognize librarians, archivists or curators whose contributions to providing professional development opportunities for librarians have been especially noteworthy or influential. Women & Gender Studies Section Award for Career Achievement (sponsored by Duke University Press), $750 award that recognizes an individual librarian for career achievement in the area of women and gender studies librarianship. Women & Gender Studies Section Award for Significant Achievement (sponsored by Duke University Press), $750 award that honors a distinguished academic librarian who has made outstanding contributions to women and gender studies through accomplishments and service to the profession. Katharine Kyes Leab and Daniel J. Leab Exhibition Catalogue Awards, (sponsored by Katharine Kyes Leab and Daniel J. Leab, American Book Prices Current) recognizes outstanding catalogues published by American or Canadian institutions in conjunction with library exhibitions. Deadline: October 15, 2018. Ilene F. Rockman Instruction Publication of the Year Award, recognizes an outstanding publication related to instruction in a library environment that was published in the last two years. Science and Technology Section Oberly Award for Bibliography in the Agricultural or Natural Sciences, this biennial award is given in odd-numbered years for the best English-language bibliography in the field of agriculture or a related science. ESS De Gruyter European Librarianship Study Grant, (sponsored by the Walter de Gruyter Foundation for Scholarship and Research): provides a €2,500 grant to support research in European studies with an emphasis on librarianship, the book trade, resource documentation and similar information-science related topics. More information, including submission procedures, past winners, criteria and contact information, is available in the awards section of the ACRL website or by contacting ACRL Program Officer Chase Ollis at collis@ala.org.